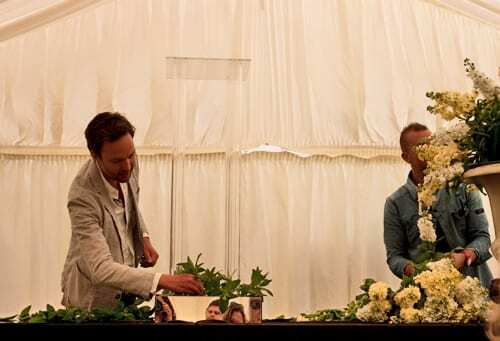 I hope you enjoyed Part 1 earlier today featuring Robbie Honey‘s floristry demonstration at the Guildford Cathedral Flower Gala. 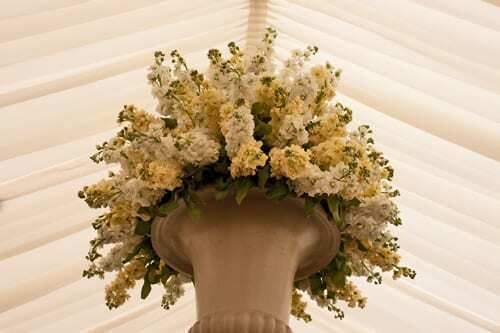 In this second blog post, you’ll see how Robbie created another floral arrangement to complement the urn design. 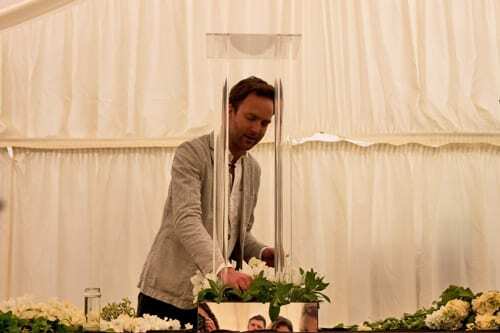 Robbie made the arrangement in a mirrored box at the base of a perspex construction with columns, which you can see below. 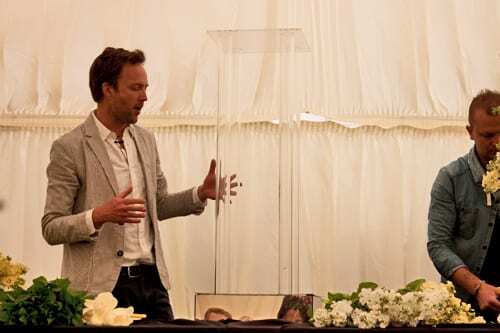 The idea behind using perspex as part of a tablecentre design is that it’s see-through, so guests can look at and talk to each other over the wedding reception table. Soaked floral foam had been placed in the mirrored box and Robbie started by greening up it up with mint. 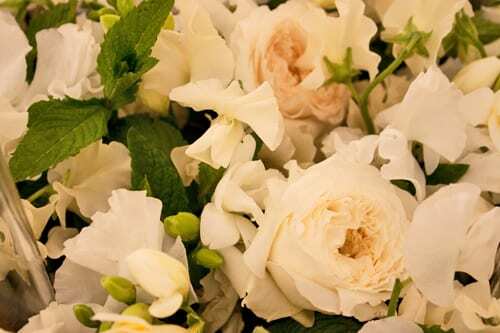 He then added two different types of sweet pea…a white Dutch variety (which was shorter and frillier) and an English pale cream variety (which was taller and tends to last a little bit longer). 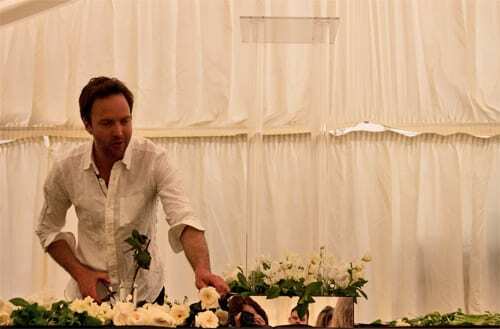 Next he added more scented blooms in the form of David Austin ‘Patience’ roses, which are buttermilk in colour. Double white freesias were then inserted into the foam. 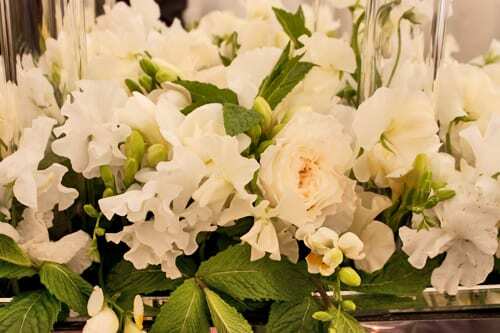 He said that they don’t have the traditional freesia fragrance and are generally more delicately scented…even likening it to the aroma of rain and pepper! 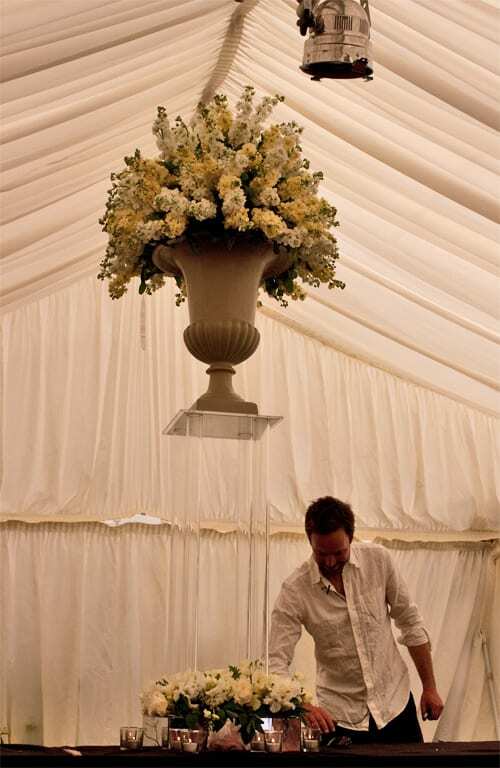 Now, remember the urn arrangement? 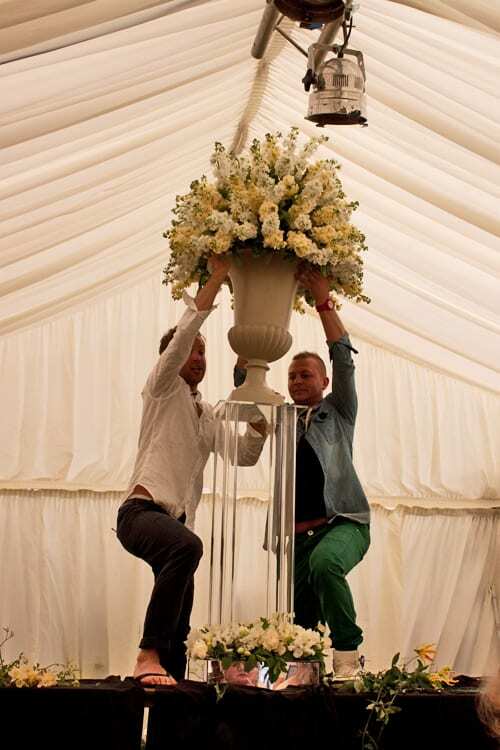 Well, the final step, which provoked a few gasps from the audience, involved Robbie and Jamie lifting the urn on to an upside-down square mirror, which was on top of the perspex construction and above the mirrored box. Then Robbie added a finishing touch with tea lights around the base. Next week, I’ll be featuring Part 3 where Robbie creates another beautiful floral design. 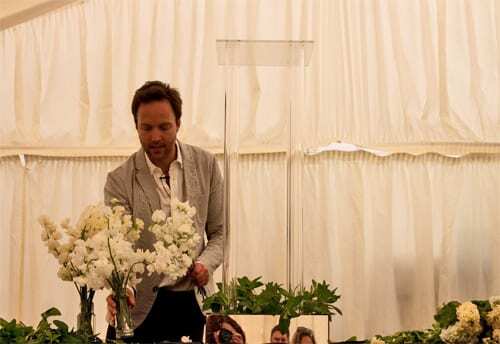 Today at 1pm at the Guildford Cathedral Flower Gala, there will be a floristry demonstration by Shane Connolly. And tomorrow, at the same time of 1pm, Joe Massie will demonstrating. Tickets can be purchased on the door at the cathedral.